Place chicken in a large freezer bag and pour in spice blend. Place in a bowl to make sure there isn't any leakage and refrigerate for at least 4 hours, but up to a day is preferable. Put all of the Spice Blend ingredients in a blender and whiz until smooth. Preheat oven to 350 degrees or grill. If using an oven, place chicken skin side up on a roasting pan and roast until cooked through (about 45 minutes) flipping once halfway through the process. If using a grill, place chicken skin-side down and grill until skin becomes crisp. Flip and finishing cooking thoroughly. Don't be afraid to blacken the chicken with this recipe. So what does Jerk mean anyways? Well there are a few different theories on that. One is the word “jerk” comes from the Peruvian word “charqui” meaning “dried meat.” Another states it evolved from a noun, “jerk”, to a verb, “jerking”, and referred to the cooking method where holes are poked into the meat so the spices can be absorbed. But author, Helen Willinsky believes the name comes from the way cooks would jerk pieces of meat off of a roast on the barbeque. 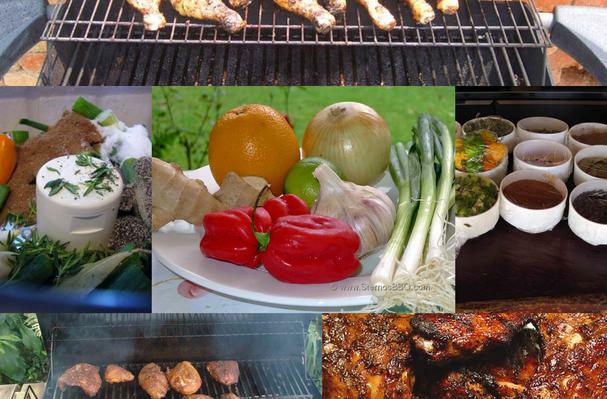 But it is commonly agreed that Jerk is a Jamaican style of seasoning and cooking. The “Jerk” style uses a marinade or paste, usually pimento, a.k.a. allspice, and scotch bonnets, also known as habenero peppers. The meat is marinated and slow smoked over pimento wood.